Even if in beta fashion, it sure is nice to see the popular music streaming platform available for Windows Phone 8. The app has garnered enormous popularity on iOS, Android, Windows Phone 7, even Symbian platforms. Spotify lets you build playlists or browse the playlists of others and you can access it from your PC at home too. You can stream the music over Wi-Fi or cellular connections, and you can also access playlists for offline music enjoyment with a subscription. Spotify comes initially with a 48 hour free trial of its Premium music subscription which can be extended to 30 days if you follow some emailed instructions. A free Spotify account allows you to listen to music on your computer and is ad supported. For $4.99 per month, you can get unlimited music on your computer. After the 30 day trial is over, the Premium subscription, which allows you to play your music on all your devices and download music for offline listening runs $9.99 per month. Spotify is a pretty neat service, though entering the Window Phone 8 arena will face stiff competition from Slacker and Nokia Music+ whose pay services have similar features for only $3.99 per month. 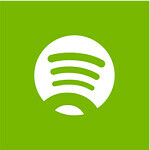 Spotify is a worthy contender though, so if you want to take it for a spin, you can link to it here. one of many to follow.... WP is really blossoming now...!!! Windows Phone grows very fast. Just downloaded the update to Nokia music today; it includes the Nokia music+ beta. I gotta say, I loved Nokia music before. I had about 7 GBs of music from the 4 offline mixes it let me download, now I have even more, plus lyrics. And for less than Spotify... I'll give it a try but Nokia came with a very strong showing.